FIGURE 1. The gecko species common in the Galveston-Houston region (Hemidactylus turcicus) has a remarkable characteristic�its tail will break off easily when roughly handled or pursued by other predators such as birds. The broken-off tail will continue to move and thereby distract a predator. FIGURE 2. A novel characteristic of the Mediterranean Gecko is its ability to cast off its tail in defense and regenerate a new one. After its tail has been cast off, it will continue to move violently for several minutes until it slows down and stops, thus giving the gecko fair time to escape. FIGURE 3. Shown above is a juvenile Mediterranean Gecko basking in the sun while nestled in a lawn during late-winter in the Galveston-Houston region. FIGURE 4. Mediterranean Geckos hatch from eggs. Several eggs may be laid in a clutch and female geckos may lay several clutches of eggs per year in our mild subtropical climate. Eggs are about � inch long and are initially soft-textured, but harden quickly. 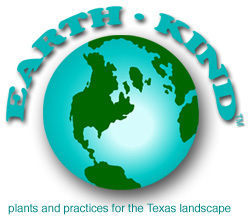 Breeding occurs March through November in the Galveston-Houston region. Adult females lay eggs. Eggs are often laid in communal nests. Primary prey are insects including cockroaches. Also preys on other types of invertebrates such as spiders. Hemidactylus turcicus is widespread across the Galveston-Houston region. Also reported in many other areas of Texas as well in many urban areas the Southeastern United States. If you notice lizards around your home at night or even caught a young one inside, they are probably Mediterranean Geckos (Hemidactylus turcicus). Mediterranean Geckos have large, unblinking eyes (i.e., there are no eyelids) with vertical pupils. They have bumpy or warty skin and their somewhat odd appearance that also matches their rather intriguing habits. The Mediterranean Gecko is the type of lizard you�ll see in science fiction movies, but you�d prefer seeing in your own backyard. That�s because the Mediterranean gecko helps provide year-round insect pest control in our landscapes and homes by feeding on cockroaches and a wide variety of other insects. In Texas, Mediterranean Geckos occur around homes and other buildings in Texas. They are widespread across the Galveston-Houston region. The Mediterranean gecko is an introduced species; it is native to Southern Europe and Northern Africa. Geckos have adapted well to living in and around homes. For this reason, their numbers and range seem to be on the increase in many areas in the Southeastern United States. The Mediterranean Gecko body is cylindrical, squat and sometimes flattened on the upper side. They have soft, granular skin that feels velvety to the touch. The coloration of a gecko is very important to their lifestyle. The skin is usually gray with several brownish-red to bright red spots and flecks. they have the ability to lighten or darken the coloring of their skin. They usually do so in order to blend in or to be less noticeable to other animals. Mediterranean Geckos have toes that are equipped with claws and sticky toe pads to aid in climbing. They are expert tree climbers. Their sticky toe pads also allow them to climb walls as well as navigate across glass and screens. They are often observed perched on walls around outside lights, waiting to grab insects attracted to the light. By day, these lizards hide in cracks, crevices and under tree bark. Mediterranean Geckos are nocturnal, being most active during the evening and nighttime hours. They are frequently found near lighted areas (such as the front entryway), where small insects are abundant during the warm season. Mediterranean Geckos remain active throughout the spring, summer and fall when they can become extremely abundant outdoors on screens and brick walls. Mediterranean Geckos have a long breeding season of about 4-to-5 months. Each adult female may lay several clutches of 2 hard-shelled eggs per year. Eggs are often laid in communal nests. Eggs are about � inch long and are initially soft-textured, but harden quickly. Unlike most lizards, Mediterranean Geckos are capable of vocalizing. Males make an advertising call consisting of several clicks. Vocalizations are also used in territorial disputes and to deter predators. Surprising encounters inside a home will likely be with immature geckos as they seek shelter. Entry into a home is typically through gaps around doorways or windows, especially those that are well-lit. Therefore, to reduce their access into the home, doors and windows should be well-sealed and caulked, especially those near outdoor lights. Also, be sure to seal all cracks and crevices along soffits, gables and other parts of the home by caulking. (Sealing cracks and crevices also serves to control entry of spiders, ants, cockroaches and many other uninvited household pests.) The presence of a single gecko in the home is considered undesirable�even frightening�by many people. Mediterranean Geckos are not harmful but their droppings can stain and contaminate carpets, floors, walls and curtains. Some people have them as pets, but bear in mind, they can have a gripping vicious bite if mishandled. They�re not aggressive by nature, they�re just defending themselves, and this means if a finger is poked at their mouth, they perceive that as aggressive behavior and will bite. An important and intriguing characteristic of the Mediterranean gecko is its ability to cast off its tail in defense and regenerate a new one. An interesting characteristic about the gecko�s tail is that once it has been cast off, it will continue to move violently for several minutes until it slows down and stops, thus giving the Mediterranean Gecko fair time to escape. The tail has several sections on it where it can break off at any given moment. It takes approximately 3 weeks for these geckos to completely regenerate a new tail, although, it is usually never as long as the original tail. 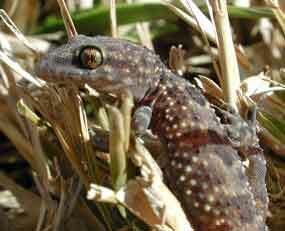 If you�re lucky enough to have a Mediterranean gecko in your yard, leave him or her alone. Speaking of luck, in parts of Southeast Asia, geckos are regarded as harbingers of luck, good fortune and fertility. 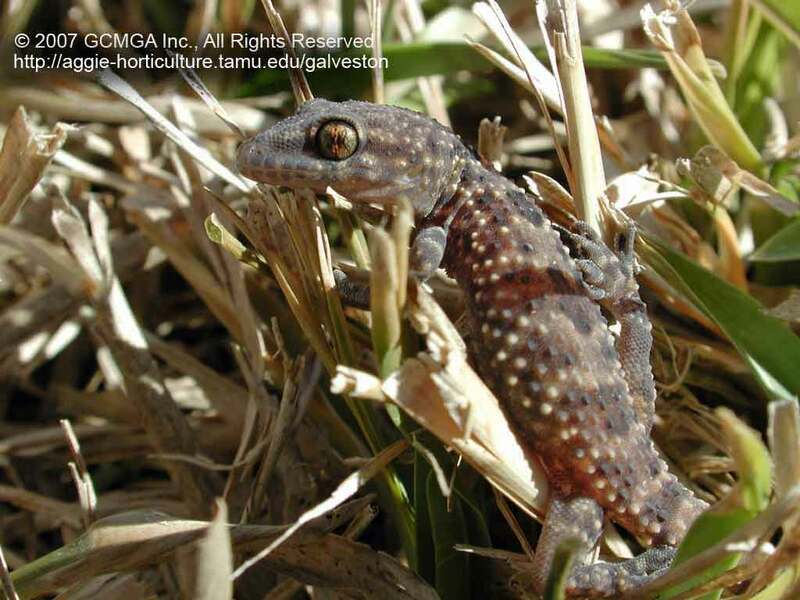 The same thing can be said of a Mediterranean Gecko in gardens throughout the Upper Gulf Coast of Texas! Whether seen in a tree, in your garden or on a glass door, Mediterranean Geckos will reward you by eating up those dreaded cockroaches as well as a variety of other insect pests. Bear in mind, though, any type of lizard is susceptible to pesticides, and if you use pesticides unwisely or improperly in your yard and garden, you�re probably not going to have many lizards of any kind around. Two additional lizards are commonly encountered in the Galveston-Houston region. Green Anoles (Anolis carolinensis) are very common. As its name implies, the Green anole is solid green in color (although its color is influenced by air temperatures and time of year). The Green Anole is rather plain in appearance and pretty laid back when compared to the Mediterranean gecko. Green anoles are beneficial critters as they prey on a variety of insects and other invertebrates. Garden Skinks are also important lizards that provide pest control in the landscape. They are an important, though typically unseen and underappreciated, partner in our diversity of beneficials.